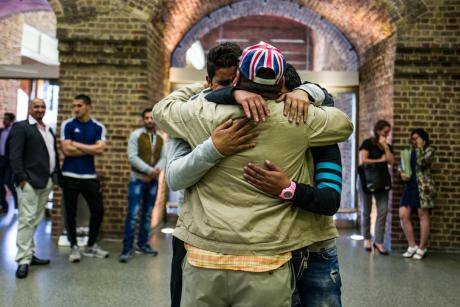 An unaccompanied minor is reunited with relatives at St Pancras. Photo: Citizens UK/Safe PassageSymbolically resonant of the Kindertransport of World War II and pitched as a vote to ‘choose love’ and save more child refugees, the Dubs amendment tabled in Parliament this week proposed a small but systematic research exercise to calculate the number of spare beds that the UK’ s 418 local councils have at their disposal to put up child refugees languishing in the overcrowded camps of Greece and Italy. The census of places would have, in all probability, made a powerful case that parts of the UK are ready, willing and equipped to lighten the burden on neighboring states and offer sanctuary to more of Europe’s unprecedented population of child refugees. The vote against this measure effectively shuts the door on hundreds, if not thousands of child refugees needing sanctuary. Having figures of available beds to hand would have put mounting pressure on the government to reinstate the short-lived child refugee resettlement programme, named after the former child refugee and Labour Lord Dubs who initiated it last year. After the government announced that it would resettle a total of just 350 children through the scheme before its closure, some 55,000 people signed a petition calling for the government to reinstate it. Their voices were echoed by a swathe of religious, public and civil society leaders. The vote by MPs on Tuesday has effectively silenced the voices of local communities whose message of European solidarity and a warm welcome to refugees is an anathema to the strictly controlled political climate of Brexit Britain. As an academic I am always alarmed when policy veers away from evidence and research. As an activist, I worry when the voices of local people and civil society are silenced and ignored. The government’s near unanimous vote against the amendment (287 to 267) was a cynical vote against transparency and against local communities. Yet it reflects a deeper malaise; the baton down the hatches mentality which has come to epitomize ‘Brexit Britain’ and which is typified by cries to keep Europe and its refugees out of ‘our’ business. So far, as Labour MP Yvette Cooper, new chair of the Home Affairs Select Committee, stressed on Tuesday in Parliament, the UK has welcomed just 0.002% of the total population of child refugees in Europe through a safe resettlement route. And in 2015 we welcomed just 3.4% (3,045) of Europe’s population of unaccompanied minors seeking asylum. This number looks more inadequate when compared with countries such as Sweden and Germany which welcomed 35,250 and 14,440 unaccompanied minors respectively in 2015. Many other countries have taken significantly more, despite their significantly smaller national populations. The UK can, in legal terms, shirk its responsibility as, under the EU Common Asylum law, asylum seekers are required to make their claim for asylum in the first country of arrival. The EU law does include a burden sharing provision for situations of ‘mass influx’. But despite almost 90,000 unaccompanied minors arriving in the EU in 2015 alone, this provision was never triggered and the UK is the only EU member state to formally opt out of the relocation schemes operating in Greece and Italy. The UK government has frequently justified its refusal to relocate refugees from Europe because of its commitment to supporting refugees abroad in the ‘global south’. But supporting refugees outside of Europe does not absolve the UK government of its responsibility to support refugees who have fled to Europe. The international refugee regime has managed the function effectively since 1951 on a dual axes of supporting asylum seekers and refugee resettlement. 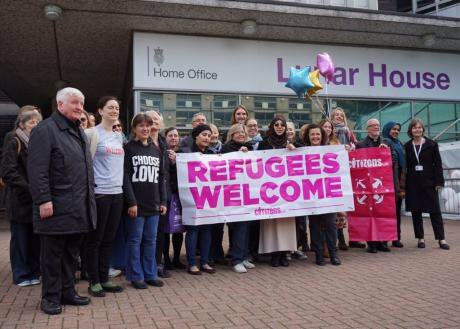 Civil society welcomes Dubs refugees. Photo: Safe Passage/Help RefugeesBut May’s government has another argument. Helping refugees ‘in the region’ (from which they flee), it is argued, inhibits the ‘pull’ factor that encourages children to take life-threatening journeys to reach Europe. By this same logic, the argument goes that by assisting southern European states in managing their high populations of child refugees through relocating to the UK those we can, we will encourage more to risk their lives and come. But rather than encouraging more children to reach out to smugglers and pursue dangerous routes, the evidence suggests that where safe and legal routes exist children are less not more likely to turn to irregular means. During the time the UK government agreed to take a limited number of child refugees from Calais and the legal right of unaccompanied minors to family reunification was operating more effectively, as Yvette Cooper pointed out in this week’s Parliamentary debate, irregular arrivals to the UK decreased. The scheme wasn’t encouraging trafficking as some have claimed, it was ‘putting traffickers and smugglers out of business’. Children calculate risks and often have a surprisingly nuanced understanding of politics and policies. And as MP Stella Creasy stressed to Parliament, we can talk until we’re blue in the face about ‘pull factors’, but for refugee kids the push factors remain the same. It is simply not the case that most unaccompanied minors in Europe want to come to the UK, but some understandably do. Others end up here by accident. In the course of my Phd research with the Becoming Adult project I met unaccompanied minors in the UK who had risked dangerous crossings from Calais to find distant family members, having lost their close family in wars. Others were motivated to pay thousands for the perilous crossing, believing that their English language skills would help them to integrate better here rather than elsewhere in Europe. I also met individuals who had never chosen to come to the UK at all. Where am I? 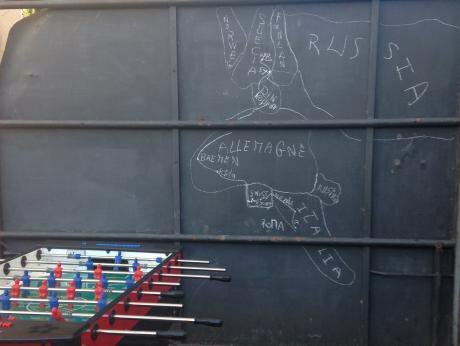 Geography lesson at a refugee centre. 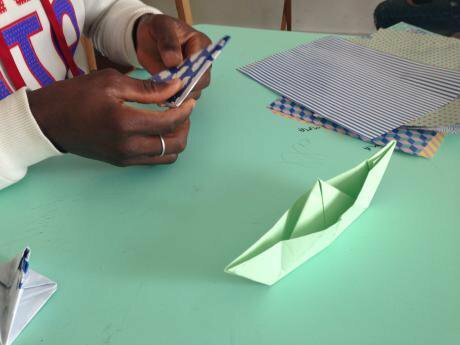 Photo: authorMy research also took me to Italy where I also met many unaccompanied minors and former unaccompanied minors who are happy and, on the whole, doing ok. But there is a huge issue of capacity and some are really struggling. Volunteering alongside support workers battling tirelessly to support these children with scant resources, I felt utterly ashamed that my country wasn’t doing more. Along with fear of the ill-evidenced ‘pull factor’, the sustained onslaught directed by right-wing media towards the young refugee men who have arrived through the Dubs scheme in recent months seems to have scared certain MPs away from any measures in favour of refugee children. I’ve written previously of how young refugee men have been commonly framed in media as sexual predators and ticking time bombs, but also of their specific vulnerabilities and needs. 90% of unaccompanied minors who arrive in Europe are male, yes. Many of those I have interviewed for my research have endured unspeakable violence, experienced slavery on route and witnessed the deaths of fellow migrants – lynching on land and drownings at sea. One prominent international NGO has started speaking of this population behind the scenes as ‘the new vulnerable’. A friend of mine who fosters, recently welcomed an unaccompanied teenager into her home. He cried for his family most days which, his social worker commented, was unusual for a boy of his age. Not, my friend pointed out, if you think for a second about what he’s been through. Many of the teenagers are fleeing persecution specifically related to their gender – family blood feuds; domestic violence in polygamous families; forced conscription. Many have become orphaned by conflict and seek to reunite with distant relatives (relatives that fall outside of the strict family definitions in UK policy). For others, their flight represents a survival stragey that is able to sustain their families back in the region of origin. We know that many local councils have explicitly told the government that they want to take more of these children through the Dubs scheme. Others, such as Hammersmith & Fulham, expressed their surprise to hear the announcement that the scheme had been closed because of a lack of capacity, when their own requests to resettle more children through the scheme had gone unheeded. Lewisham Council, for example, has to date received just 1 child to fill the 23 places they pledged. Bristol are waiting on 10, Birmingham on 79, a majority of Scottish local authorities have voiced a desire to support more children. As emerging findings from the Becoming Adult research demonstrate, challenges for some local authorities in welcoming refugees shouldn’t be underestimated, nor should the difficulties for the government of managing disproportionate numbers in some regions over others. We know that when young refugees are not given the right support they can experience important threats to their wellbeing. Yet our research also demonstrates that where they are welcomed and supported, unaccompanied refugee children can thrive in our communities. Unaccompanied teenager in Italy. Photo: authorSo where local authorities are being explicit that the beds are ready and the community welcome is there, how can the government still claim there is no appetite or capacity to help refugees currently languishing on the street or in overstretched camps in the South of Europe? The decision on Tuesday to vote against the Dubs amendment must be read alongside May’s rightly controlled Brexit/anti-refugee whip. It's important to stress the fact that the child refugees brought to Britain under the Dubs scheme are already in Europe because it’s a crucial element that has frequently been overlooked in our understanding of the popular and political backlash against them. As Heidi Allen, the Conservative MP that tabled the amendment to the Children and Social Work Bill stressed in her presentation to Parliament, the Dubs amendment is not just about helping child refugees, it’s about ‘European solidarity’. While some wrongly feared that dozens of Tory MP’s would rebel against the whip and vote in favour of the amendment, in reality they didn’t. Spectators spoke of seeing the Prime Minister physically move MPs into the voting gallery; so May was able to retain her record never to have suffered a parliamentary rebellion. Post-Brexit, as the UK becomes more and more symbolic of a divided and unequal Europe, doing our small bit to assist refugees who have arrived in Europe is surely the least that is necessary to maintain our credibility in the continent?